Del 7 al 30 de noviembre se puede visitar la 23 Muestra de Pintura y Escultura “Paleta de Colores” organizada por la Hermandad del Desconsuelo y tengo el honor de haber sido nombrada Madrina de la Muestra. 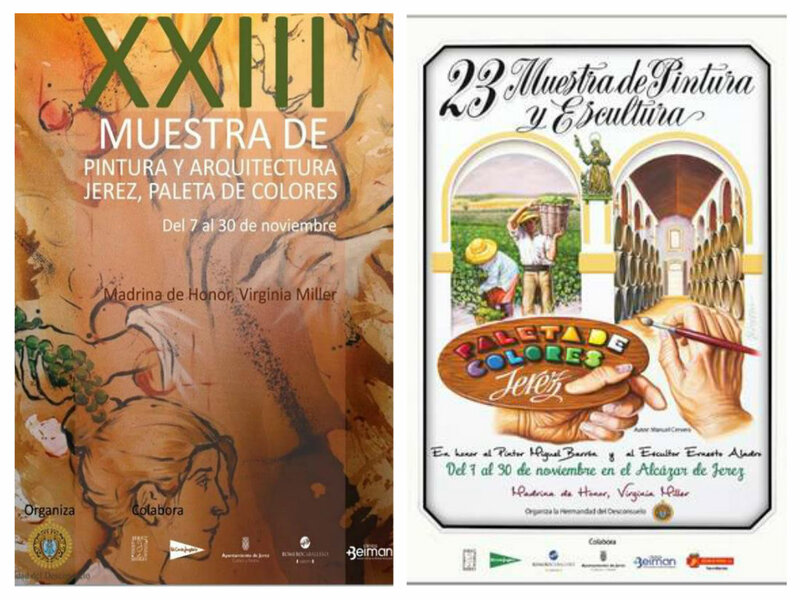 From the 7th through the 30th of November, you can visit the 23rd Annual “Palette of Colors ” Painting and Sculpture Exhibition organized by the Brotherhood of the Desconsuelo. I have the great honor of being named as the “Godmother” of this year´s exhibition. La inauguración tuvo lugar el viernes día 7 de este mes. El Hermano Mayor de la Hermandad, Ángel Bocarando Chacón, presidió este acto en el que estuvo también Antonio Real, Concejal de Turismo, Carmen Aumesquet, Jefe de Promoción del Consejo Regulador, el escultor Ernesto Aladro, uno de los homenajeados y Manuel Barrón en representación de su abuelo, Miguel Barrón, el pintor homenajeado. The opening day of the exhibition was held on Friday, the 7th of this month. The elder Brother of the Brotherhood, Ángel Bocarrando Chacón, was our host that evening. 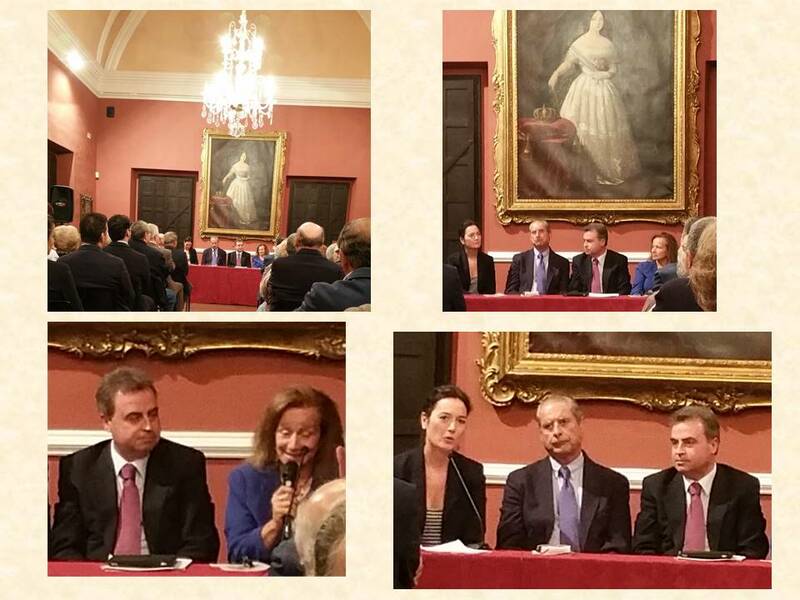 Also present was Antonio Real, the City of Jerez Tourism representative; Carmen Aumesquet, Marketing Director for the Sherry Regulatory Council; the honored sculptor, Ernesto Alador; and Manuel Barrón, who was representing his grandfather, Miguel Barron, the honored artist. La exposición consta de 82 cuadros y 45 esculturas. Hay una gran variedad de estilos y un par de salas donde se exponen los cuadros dedicados a Jerez, Ciudad Europea del Vino. The exhibition includes 82 paintings and 45 sculptures. 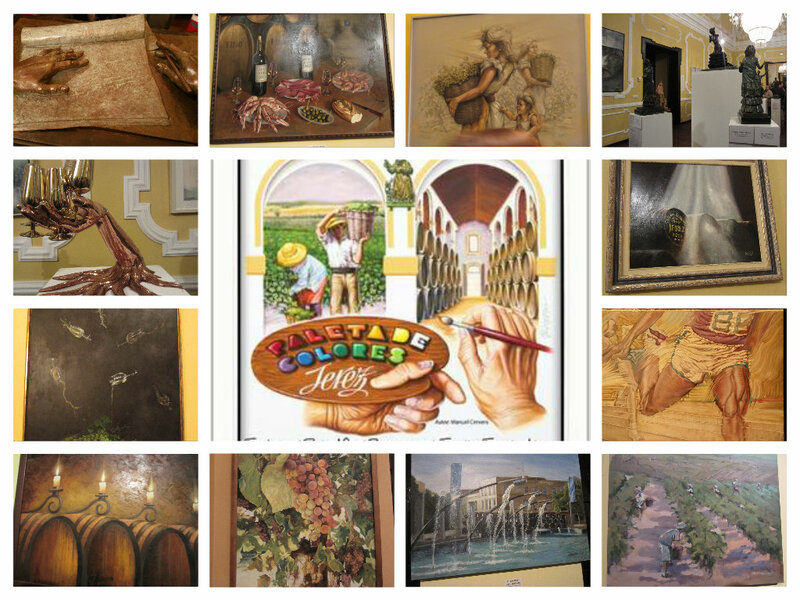 A great variety of styles are represented in the exhibition and there are two exhibition areas that are devoted to the City of Jerez, which was named as the 2014 European Wine City. El Consejo Regulador y Discover Sherry donaron botellas con jereces especialmente seleccionados y con la etiqueta del cartel anunciador de Paleta de Colores. Las botellas pueden encargarse en la exposición. La recaudación irá para la Hermandad del Desconsuelo. 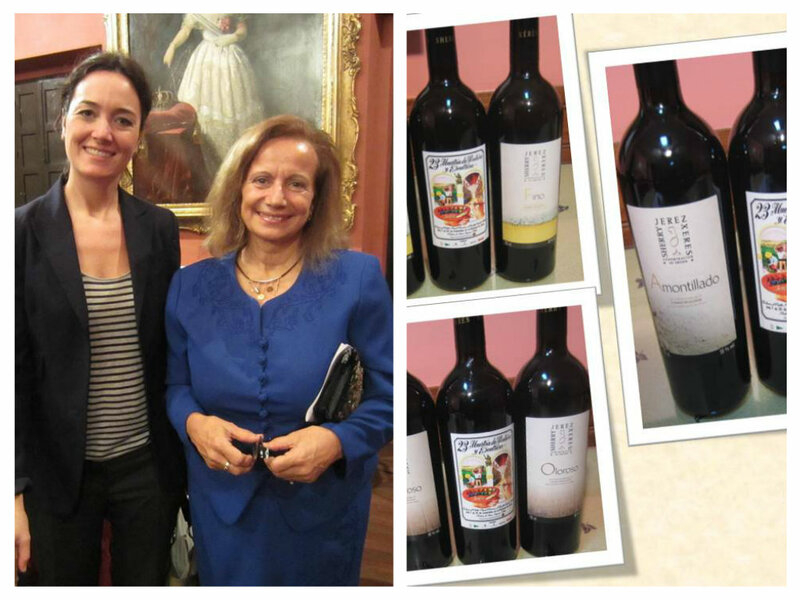 The Sherry Regulatory Council and Discover Sherry donated a good quantity of specially-selected bottles of Sherry wines, that sported a duplicate of the Palette of Colors poster as part of their labels. The bottles can be purchased at the exhibit. 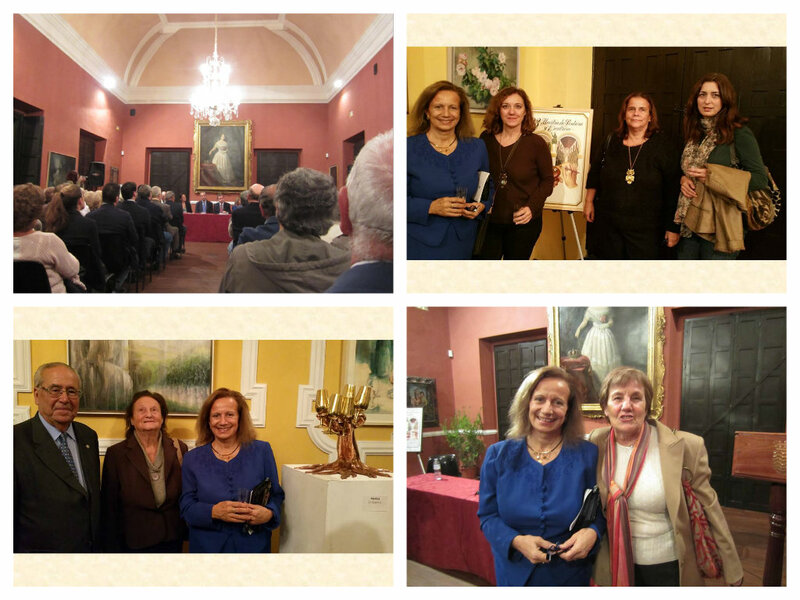 The funds will be donated to the “Hermandad del Desconsuelo”. La inauguración estuvo muy concurrida y González Byass ofreció una copa de fino al final de la ceremonia. La Muestra puede visitarse en El Alcázar hasta el 30 de noviembre. ¡¡ No te la pierdas!! The grand opening was well-attended and, at the end of the ceremony, the González Byass winery provided complimentary glass of Fino Sherry wine. You can visit the Exhibition at the Alcázar, in Jerez, up until the 30th of November. Don´t miss it!! Os pasamos el enlace del video.